Set in a peaceful riverine grove Dulini's six exquisite suites all offer private views of the Mabrak River. Dulini speaks of a deeply personal wildlife adventure: the quintessential safari experience for the sophisticated traveller. You will instantly feel at home in this quiet retreat where classic interiors enfold guests in romance and elegance. The six spacious suites boast plunge pools, outdoor showers and shady decks. 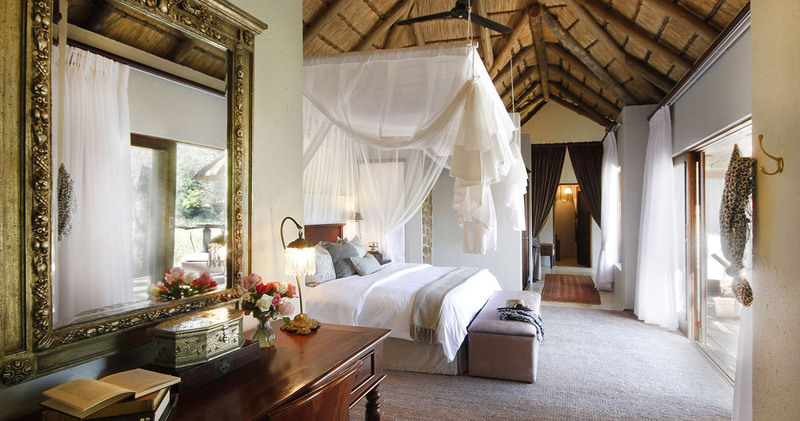 Interiors epitomise romance with canopies of billowing mosquito nets and beautiful bathrooms. From the privacy of the suites, guests can enjoy views of the riverbed, seamlessly integrating the grandeur of nature and elegance of décor. Enjoy a brisk work out in the well-equipped gym, or simply relax in the guest lounge on a welcoming sofa. Enjoy bird watching from the lounge patio or the magnificent deck overlooking the Mabrak river. Dine under the ancient jackalberry tree or steal away for a romantic private dinner at your suite. Browse the African handicrafts in the safari shop. Fine wine and dining, enhanced by the culinary tradition of African flavours, complements the luxurious accommodation. Our experienced and creative executive chef is committed to culinary excellence. Personal butlers attend to guests every delight. Surprise bush experiences in the form of bush dinners and breakfasts are designed to wow guests. The intimacy of the boutique lodge, is ideally suited to indulging the safari dreams of individual adventurers, as well as exclusive parties of guests celebrating special occasions; while the romantic ambience ensures a lavish retreat for honeymoon couples. Dulini speaks of a deeply personal wildlife adventure: the quintessential safari experience for the sophisticated traveller. Game drives at Dulini Private Game Reserve are taken by professional and passionate rangers and trackers, who have a wealth of knowledge to unravel the intricate nuances of the African bush. Many of them grew up in the area and thus, their knowledge of the environment is unrivaled. All of them are professionally qualified to manage the rigorous responsibilities of the safari experience. It is these characters that will win your heart with heroic stories, wow you with phenomenal bush tales and leave you awestruck by their knowledgeable interpretation of the African wild. The Dulini field guides are well-versed in creating a memorable safari and will endeavor to position the vehicle for the best photographic opportunities for guests. Dulini Lodge offers a wonderful honeymoon special. Brides receive a 50% discount when staying for a minimum of three nights. Valid through 31 December 2019. Having visited many Sabi Sands reserves over the years, Dulini certainly exceeded our expectations and can be recommended. The lodge blends in with its environment and is very comfortable and well appointed with the African bush theme. Suites are spacious and comfortable. The management and staff go the extra mile and are amazing. They made our bush experience unforgetable. Our ranger Andrew was excellent as well as Phixson our tracker. We had quality game viewings and saw everything we should have. Thanks to all for an awesome 4 days. Our 3-night stay at Dulini was the first leg of our South African honeymoon, and was an absolutely wonderful way to kick things off. The lodge itself is lovely, quaint and rustic but with modern touches. The common areas are extremely well maintained and the lodges themselves are beautiful - we have very high standards when it comes to lodging, and the Dulini exceeded our expectations. That being said, the standout here was the service and the staff. From the moment you arrive, you feel incredibly special and everyone is so nice to you and catering to your every need. The food is wonderful. Our actual safari experience with &Beyond was amazing...we saw everything we wanted to see in our 6 drives, and our ranger Will and tracker Issac were incredible and really made the experience - we had so much fun!! You will not be disappointed if you choose to stay at Dulini, and I'd like to thank everyone there for making our time there so special and memorable. Dulini will surely offer you an intimate experience as there are only six suites, all with private plunge pools. Read all about travelling to Dulini Lodge on our getting to Sabi Sands page. Dulini is best accessed through Kruger Mpumalanga International Airport (MQP) near Nelspruit. Children eight years and older are welcome at Dulini. Children between the age of eight and sixteen will be charged 50% of the regular rate when sharing with one or two adults. We hope you have found all information needed to decide that Dulini Lodge in the Sabi Sands Game Reserve is the perfect place for your next travel adventure. Please fill in the contact form and we will get back to you soon!